This is a 3 minute and 57 second excerpt from an interview with Katie Bullard, Chief Growth Officer at DiscoverORG. We asked her what makes the DiscoverOrg approach to database management, a database platform, different and this is her response. Do you need an Intelligence Platform? It’s one thing to talk about AI and machine learning and try to filter out the nonsense claims of a hundred companies that say they can deliver information about customers, buyers, competitors and your mom and dad; it’s another thing to find someone that has a platform that makes sense of the flood of gobbledygook flowing into your company. 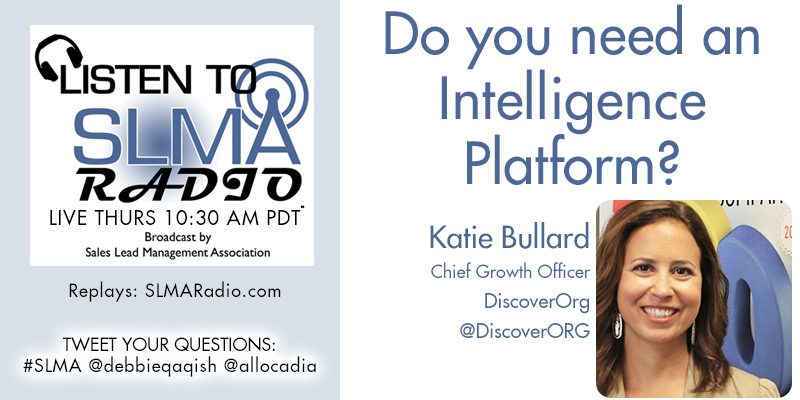 In this interview with Katie Bullard, Chief Growth Officer at DiscoverOrg we discuss what a marketing intelligence platform is and isn’t and why to compete going forward you have to make some decisions on employing an intelligence platform. The host is Jim Obermayer. Prior to joining DiscoverOrg, Katie served in executive leadership roles at Mitratech, Accruent, and Hoover’s. She has a bachelor’s and masters degree from the University of Virginia. Katie is responsible for leading the global marketing, product management, and partnership functions at DiscoverOrg. She brings 15 years of marketing, product, and strategy experience in global, high-growth technology businesses to her role at DiscoverOrg. DiscoverOrg is the leading global sales and marketing intelligence tool used by 4,000 of the world’s fastest growing companies to accelerate growth. DiscoverOrg’s award-winning solutions provide a stream of accurate and actionable company, contact, and buying intelligence that can be used to find, connect with, and sell to target buyers more effectively – all integrated into the leading CRM, SDR, and Marketing Automation Tools in the market. DiscoverOrg has a team of over 250 researchers refreshes every data point at minimum every 60 days – ensuring customers reach the right buyers with the right message at the right time.